The spacious studios and apartments of the Boutique Hotel Tilos Mare on the island of Tilos, in Greece, are all with private bathrooms with shower, air conditioning, TV LCD, free Wi-Fi, have a kitchenette with electric stove, refrigerator, utensils, crockery and various accessories for the kitchen, tables and chairs; in the two-room apartments there is a dining/living area. Daily cleaning is provided. 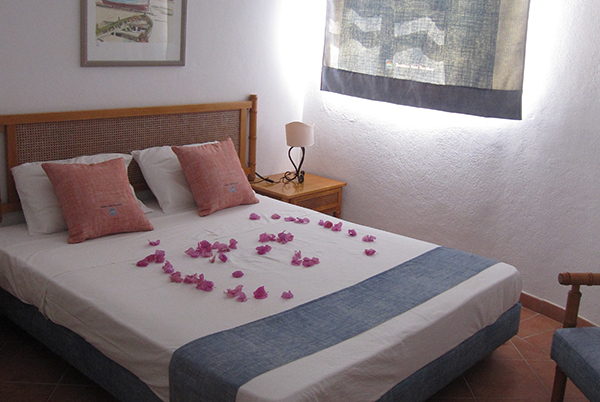 Boutique Hotel Tilos Mare is just a few steps from the sea, the center and the port of Livadia. Its architecture, with the typical white of the constructions of Greece, interrupted only by the bright blue of the windows and the doors, is amalgamated and plunges into the elegant genuineness of the island, in full harmony with its landscapes. There is a swimming pool equipped with deck chairs, sun beds and umbrellas for free use. 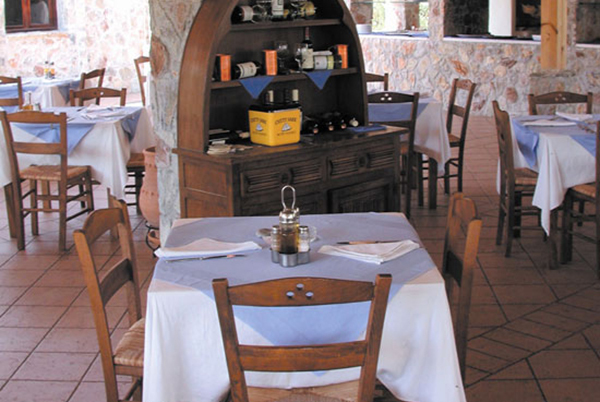 The Gourmet Pizzeria Restaurant, built in stone and furnished in typical Greek style with outdoor tables, gives a very welcoming, informal, romantic and enveloping location, is open every day both for the Hotel ‘s guests and for external clients. The “Boutique Hotel Tilos Mare” located in Tilos (Dodecanese) the island always full of stars, solitary and natural beaches, crystal clear sea, stands on area of 6000 sq.m, it’s a five minute walk from the beach, located about 400m from the small port of Livadia and its center. Completely renovated in 2018 both in the fabrics (reception, sofa curtains, armchair chairs) and in the replacement of all bathroom accessories, the painting of all spaces, the restyling of the pool, new gardens. They are furnished with taste and style: high-level materials used(wrought iron, customized Italian fabrics, terracotta floors, wooden furniture, paintings by the famous Italian painter Aldo Riso). Its charm will capture you; you will find the right atmosphere that will fill you with enthusiasm. Each room has a kitchenette with electric stove, refrigerator, utensils, crockery and various accessories for the kitchen, table and chairs. Air conditioning and /or shovels and tv. Attached to the hotel, this year (2018) is scheduled to open the Tilos Mare Gourmet Restaurant Pizzeria: the guests of the Boutique Hotel will be able to enjoy special discounts. 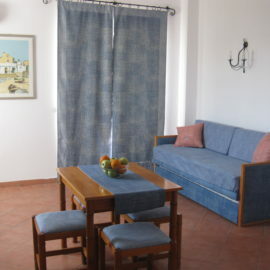 The room of the Tilos Mare Gourmet Restaurant Pizzeria is about 400 sq. m., it is outdoors and placed under a large pergola with wooden beams and typical exposed stones. In the crystal clear and pristine sea! The new home of the Boutique Hotel Tilos Mare is online. Tilos Mare is a perfect hotel to spend a "real holiday". A family atmosphere but at the same time very professional. The property's staff is very helpful and polite. 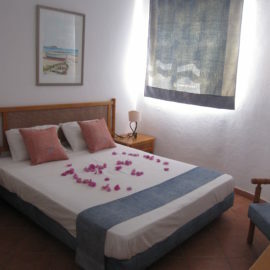 The rooms are spacious, clean and quiet, including all comforts. If you want to spend a holiday in Tilos, I suggest this Hotel. Recommended for couples, families and groups of friends. Rated 10 !!!! We stayed at the Tilos Mare two weeks between August and September. They welcomed us warmly and Francesca and Maria Carla, always kind, patient and helpful. 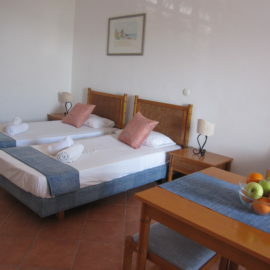 Room on the first floor with sea view, impeccable cleanliness. Breakfast good and plentiful, served practically from dawn to noon, often with pleasant daily surprises. The hotel is one of the few on the island with a swimming pool, in a prime location for everything. I think we will return, the island itself is a hymn to peace and tranquility and the Tilos Mare is its worthy representative. It is the true small Greek island! I had already been there last year and had fascinated me. I returned there this year. Island always magical with an atmosphere of other times. Same opinion for the hotel. Essential furniture with quality materials in typical style. Comfort, cleaning and high-level staff. The pool is another "gem". I will definitely be back!